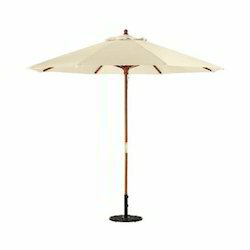 The 9 Foot Wood Market Umbrella is the most popular style of wood market umbrella in the US for a reason. It's elegant design, quality workmanship and easy to use features makes this umbrella the perfect choice for those looking for an elegant, exotic look..
We are engaged in manufacturing and supplying Wooden Patio Beach Umbrellas that is used to provide the users complete relaxation & protection from tanning owing to direct sunlight. We offer to our clients a wide range of patio umbrella that is used in patio, veranda or deck to shade oneself from sunlight. Offered in multitude of colors, prints, designs and sizes, our umbrellas exude a sense of grace & sophistication in the ambiance of exteriors. We offer our client an excellent quality range of Lamp Post Umbrella. These lamp pole umbrella are offered in variety of designs, shapes, sizes and colours. 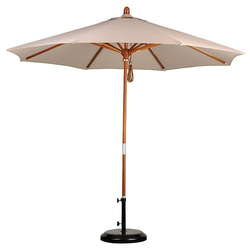 Our assortment of lamp pole umbrella are available at market leading prices.